For vintage watch collectors, the difference between a “grail” watch and an ordinary watch is often a matter of small details. The texture of the paint, the length of a hash mark, the style of the serifs or the aging of the lume can all affect the collectability and value of a vintage watch. The 10x loupe has become standard equipment for examining the rare ones; sometimes, we need the extra power of a microscope, just to be sure. We showed you how little details can make a difference in the Black PVD Heuer Monaco. It’s not so nuanced, however, for those pursuing the rarest of the vintage Heuer chronographs. There is one word — located at the top dead center of the dial — that evidences the rarest of the rare in the world of vintage Heuers. The word “Chronomatic” alerts the collector that he or she has found the ultimate vintage Heuer chronograph. In this posting, we will consider where the origins of the word “Chronomatic” and provide an overview of the four (or five) models that bear this special designation. 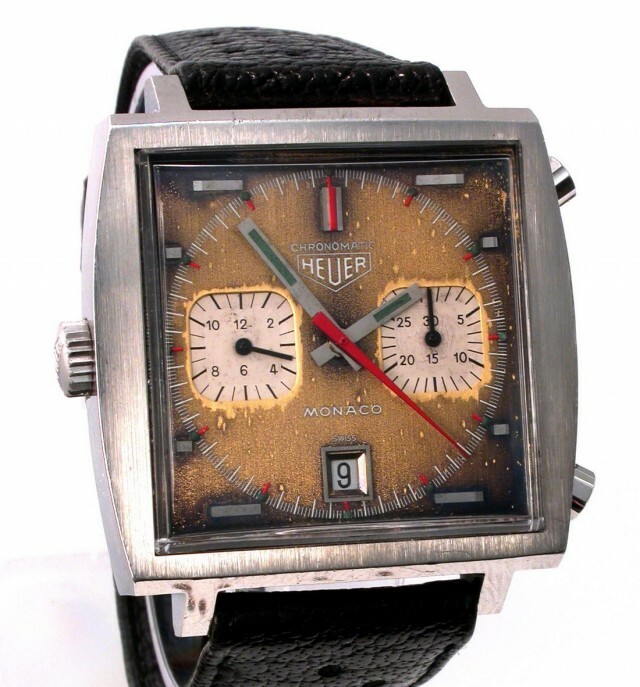 The word “Chronomatic” indicates that this is one of the rarest of the vintage Heuers. Photo courtesy of Rich Crosthwaite. The First Automatic Chronographs. In 1968, Heuer — in an alliance with Breitling, Buren and Dubois-Depraz — was competing with Zenith and Seiko to produce the world’s first automatic chronograph. In spring / summer of 1969, Heuer and Breilting became the first brands to offer automatic chronographs in major world markets, with Heuer using the newly-developed Caliber 11 movement to power new versions of its Autavia and Carrera, as well as the entirely new Monaco model. (Seiko seems to have been first to market automatic chronographs, introducing its Reference 6139 in May 1969, but sales were limited to Japan.) (For the story of the race to build the worlds first automatic chronograph, see Project 99 — The Race to Develop the World’s First Automatic Chronograph.) To celebrate the fact that the chronograph had now become automatic, Heuer and Breitling both used the “Chronomatic” name for their watches. Heuer placed the “Chronomatic” across the top of the dial, with the model names “Autavia”, “Carrera” or “Monaco” across the bottom. 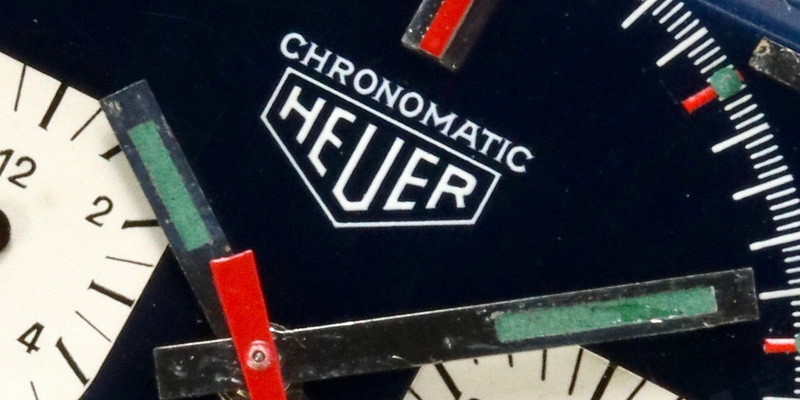 Within a few months, however, Jack Heuer — then President of Heuer Leonidas — realized that potential customers often did not understand the meaning of “Chronomatic”. Accordingly, Heuer ceded the “Chronomatic” name to Breitling, and from then on Heuer moved the Autavia, Carrera and Monaco names to the top of the dial, with the words “Automatic Chronograph” placed prominently across the bottom of the dial. It appears that Heuer produced only a few hundred watches marked “Chronomatic”, which explains their extreme scarcity in today’s market. 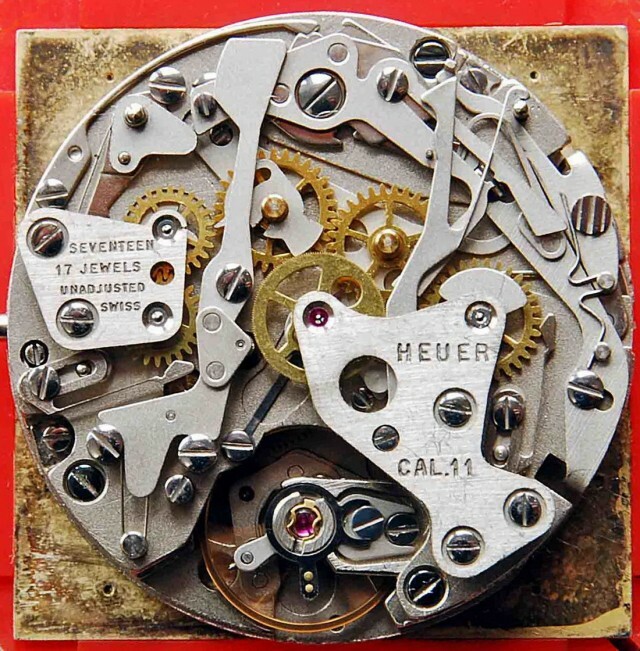 The Chronomatic Heuers were powered by the Calibre 11 movement, the automatic chronograph movement jointly developed by Heuer, Breitling, Buren and Dubois-Depraz. Photo from OnTheDash.com. 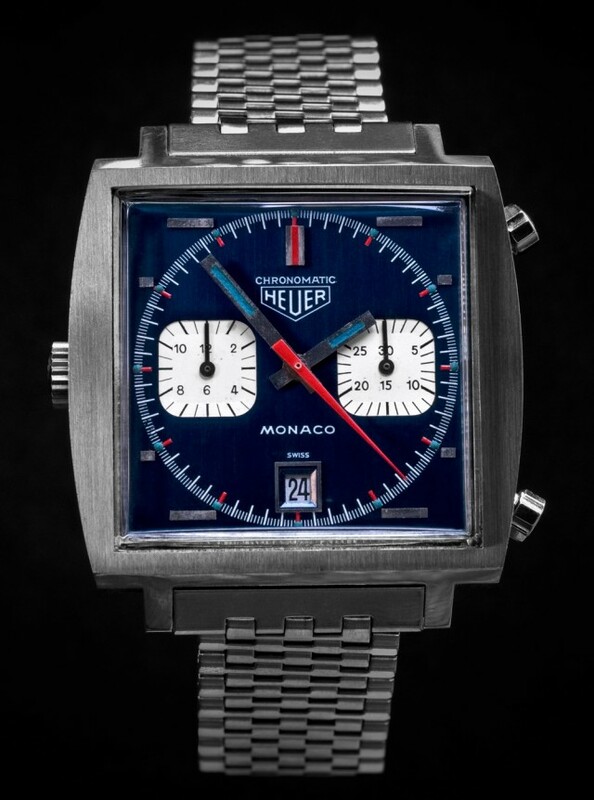 Monaco – While the Autavia and Carrera were existing Heuer models that were redesigned to accommodate the new automatic movements and to offer the look of the 1970s, the Monaco was an entirely new model. The square-cased Monaco offered a unique avant-garde style, with the case made waterproof by a unique array of clips and springs, with a black rubber seal between the dial and the crystal. 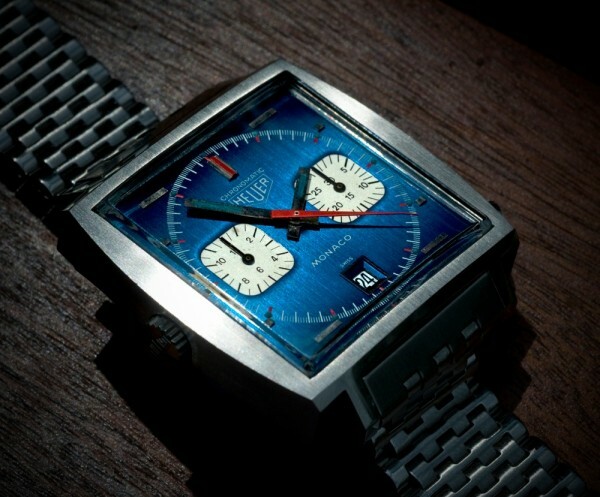 Features that differentiate the Chronomatic Monacos from the later, standard production model include polished steel hands with squared tips (the standard hands are brushed steel, with red tips and accents); metallic blue paint (compared with the flat blue of the standard models); and lume with a unique blue tone. On at least one batch of these early Chronomatic Monacos, the metallic blue paint deteriorated over the years, so that the dial has a brass tone, giving us what collectors call the “Paintless Wonders”. The community of vintage Heuer collectors has seen approximately 15 Chronomatic Monacos over the last decade. Rich Crosthwaite, who operates an online vintage Heuer price guide, estimates that the best samples of the Chronomatic Monacos sell in the $40,000 to $50,000 range, with the “Paintless” samples selling in the range of $20,000. The Chronomatic Monacos have a distinctive midnight blue paint, with a metallic look. The blue lume on the dial and hands is unique to this model. Photo courtesy of Rich Crosthwaite. The midnight blue paint on some of the Chronomatic Monacos deteriorated, so that only the brass tone of the dial remains on the “Paintless Wonders”. Photo from OnTheDash.com. Carrera — The Chronomatic version of the Carrera had a dark gray dial, with contrasting white registers and inner tachymeter ring, and polished steel hands. These first Carreras closely resemble the later production models. Heuer produced a series of Chronomatic Carreras for Abercrombie & Fitch, and these models are co-branded with both the Abercrombie & Fitch and Heuer names on the dial. The Carreras are the rarest of the Chronomatics in today’s market, with only a handful of the models surfacing over the last decade. While the scarcity of these watches makes it difficult to estimate a market value, Crosthwaite refers to a mint sample that sold for just over $11,000 in late 2010, and suggests that prices for the best samples would range from $10,000 to $20,000. 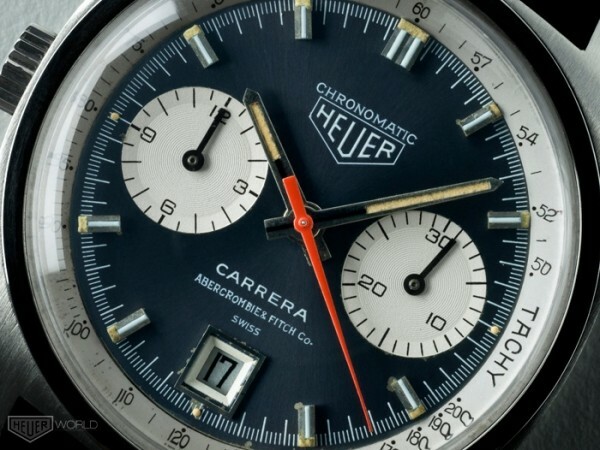 This Chronomatic Carrera was produced by Heuer for retailer Abercrombie & Fitch. Photo courtesy of Rich Crosthwaite. 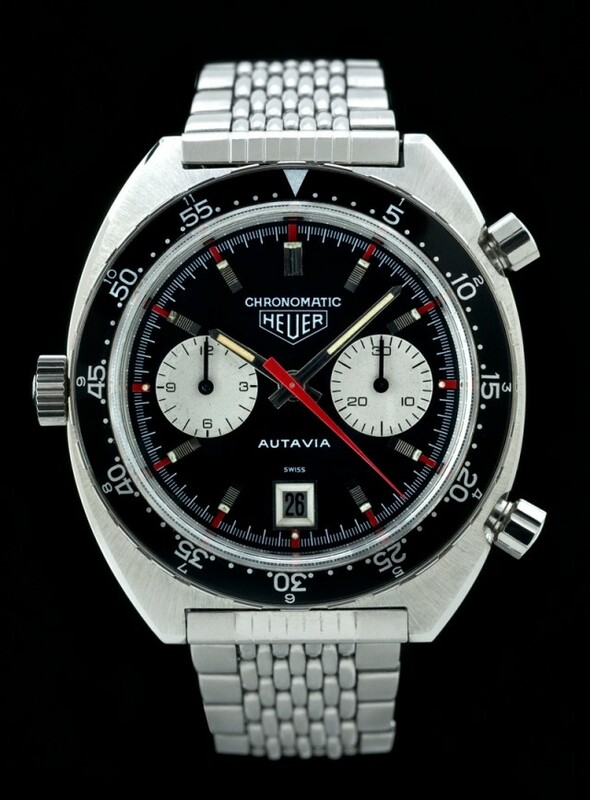 Autavia — Heuer produced two versions of the Chronomatic Autavia, one with a white dial and one with a black dial. The white-dialed Chronomatic Autavias feature blue accents on the dial and a rotating Tachymeter bezel, and are known as “Siffert” models, as this was the watch worn by Swiss Formula One racing hero, Jo Siffert. The black-dialed Chronomatic Autavias have red accents on the dial and a Minutes / Hours (MH) bezel. Swiss Formula One hero Jo Siffert wore this version of the Chronomatic Autavia. 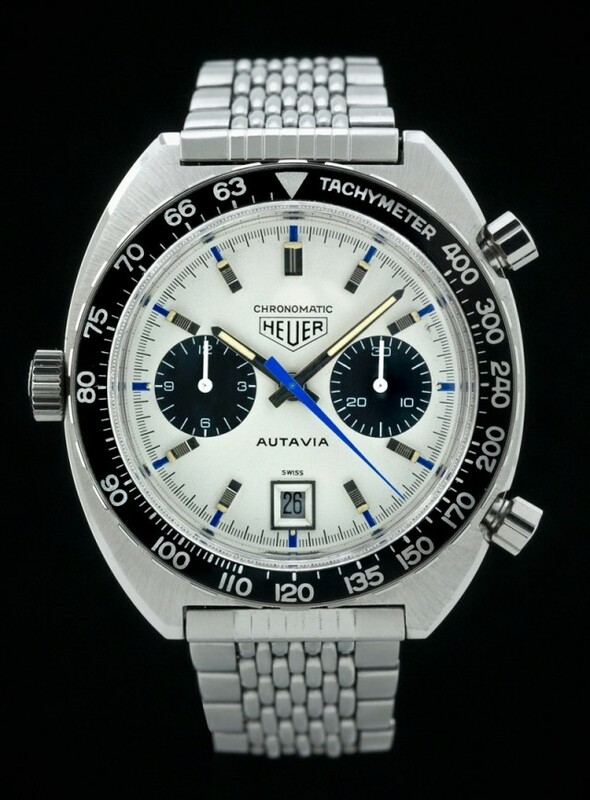 This Chronomatic Autavia and other Autavias with the white, black and blue color scheme are known as “Siffert” Autavias. Photo courtesy of Rich Crosthwaite. The online community has tracked approximately a dozen of the white-dialed Sifferts and fewer than five of the black-dialed model. Crosthwaite suggests that very nice samples of the Siffert have a value between $35,000 and $40,000. While the black-dialed Chronomatic Autavias have been far more scarce, they also have less of a following, suggesting prices in the $20,000 to $25,000 range. This first black-dialed version of the automatic Autavia features the word “Chronomatic” in a strong font, along with distinctive red accents on the dial. This version is scarcer than the “Siffert”, but sells at a discount to the favored model. Photo courtesy of Rich Crosthwaite. But wait, there’s one more. In late 2011, the community of vintage Heuer collectors discovered a fifth version of the “Chronomatic” chronograph (or at least a dial for this version). 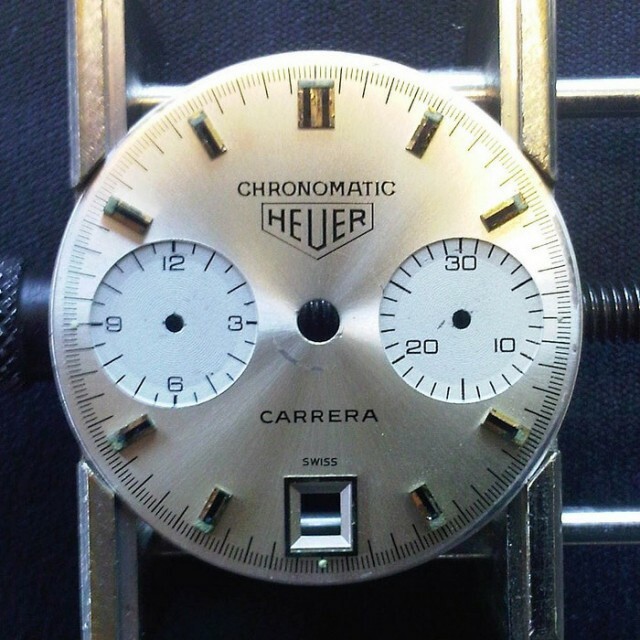 This previously-undocumented Chronomatic Carrera has a silver-white starburst dial, with white registers. Because we have only seen this dial, and not a complete watch, we can only speculate about the other elements of the watch — hands and inner bezel — and we are left to guess whether this execution was only a prototype or actually went into limited production. For an analysis of this unique dial, see the OnTheDash blog posting Mark Moss Analyzes a Rare Chronomatic Dial. Today’s vintage Heuer collectors have never seen a white-on-white dial in a complete Chronomatic Carrera, but this dial is believed to be authentic. Photo courtesy of Rich Crosthwaite. Heuer Chronomatics — The Bottom Line. In future articles, we will be covering many of the collectible vintage Heuer chronographs. In the meanwhile, if you are at a flea market or garage sale and see the “Chronomatic” above the Heuer shield, you will do well to buy the watch, as quickly as you can pull the money out of your wallet and hand it to the seller. You will be bringing home one of the rarest vintage Heuers, one of fewer than 30 that are known to the current collectors community. This posting was written by Jeff Stein and was originally published in Longitude — Christie’s blog for collecting watches, on September 13, 2012. As indicated in the captions, most of the photographs are courtesy of Rich Crosthwaite. Rich Crosthwaite researches and collects vintage Heuer chronographs, has created the www.heuermonaco.co.uk and www.heuerpriceguide.com websites, and has written a book Heuer Monaco — Design Classic. Follow Rich on Twitter @heuermonaco.